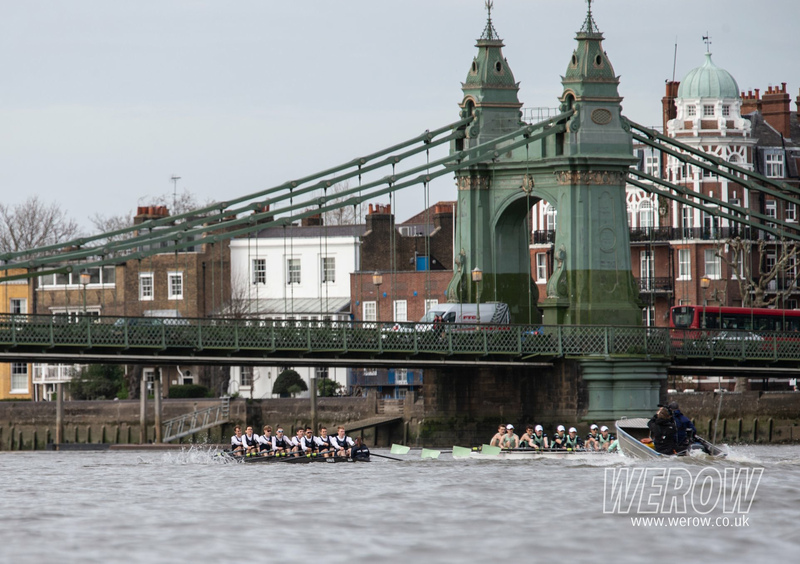 The Oxford Lightweight Blue Boat leads its Cambridge rivals just after Hammersmith Bridge. Photo by permission of Allmarkone. Oxford and Cambridge rowing fans have more to cheer about on the Tideway, and although it is distinctly light in style, it is heavy on class. 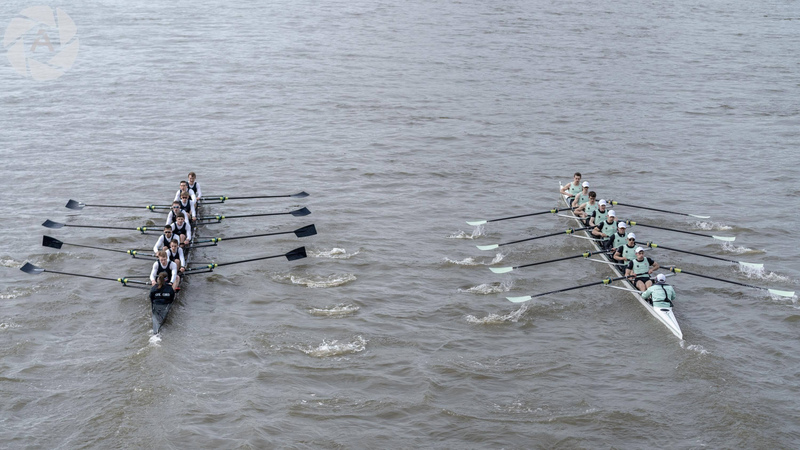 The 45th Oxford and Cambridge Lightweight Boat Race was held on Saturday 23 March. For the first time in its history, it was raced over the Championship Course on the Tideway. Previous races were held over the original Boat Race course in Henley. Moving the race to the Tideway was done on the initiative of the committee this year’s Oxford University Lightweight Rowing Club and was agreed to by their Cambridge rivals. The move has long been talked about, by nothing had previously been done to make it happen. Prior to the race, Oxford won the toss and chose the Surrey station, meaning Cambridge would have the advantage on the Fulham bend early in the race, but Oxford would thereafter have the inside of the long Hammersmith bend. Immediately, Cambridge sought to make the most of their station, sprinting away from the start at 46 strokes per minute. On the Surrey side, the Oxford crew seemed to make heavier going of the conditions and only managed 42 strokes per minute in the opening 10 or 15 strokes. Cambridge certainly looked to be the neater of the two boats, and had a slight advantage as both crews began to settle into their race rhythms. Cambridge were rating slightly higher at 37 to Oxford’s 36. The Light Blues were the underdogs for the race, with Oxford crew having won gold in the lightweight coxless fours at the European University Games last year. Such preconceptions seemed a little out of place, however, when Cambridge began a long, aggressive push at the three-minute mark in the race. With the Fulham bend favouring them, Cambridge opened up a lead of perhaps three quarters of a length, but could get no more than this. The rate in both boats was 35 as the crews approached Harrods Depository, where Oxford made a push of their own. 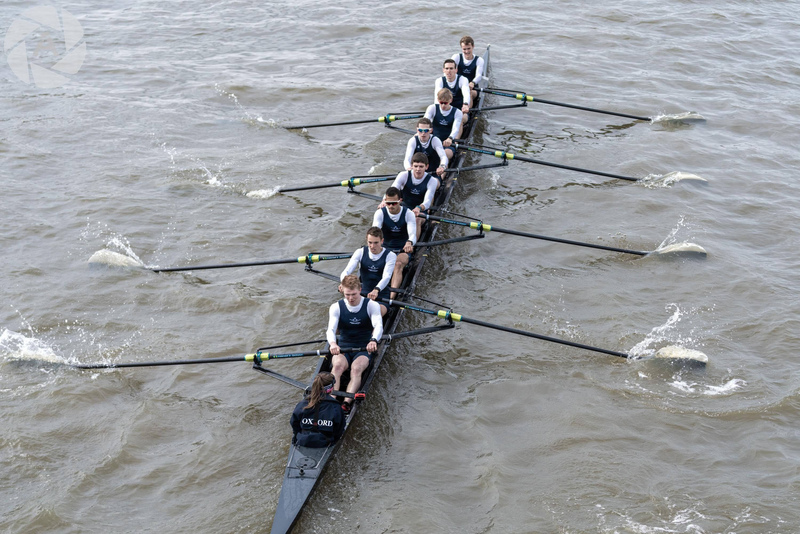 With the assistance of the bend, Oxford made up the gap between the crews such that the Light Blues had an advantage of just 0.14 seconds at Hammersmith Bridge. Cambridge have the lead, but only just as the crews close on Hammersmith Bridge. Photo by permission of Angus Thomas at WeRow. Recent heavyweight races between the two universities have seen some antagonistic coxing, and even blade clashes, however none of this was the case in this race. The performance of both coxes was excellent; letting the crews go about their work, but without surrendering the stream to the other boat. The Cambridge cox, Jack Mason, tried an aggressive line approaching the Hammersmith Bridge and drew a warning from the umpire, but had the sense not to steer so hard as to take away from his crew’s poise. Coming out of the bridge, it appeared obvious that Oxford had a definite speed advantage, and had indeed managed to get their bows ahead. At St Paul’s School boathouse, Oxford was between a third and a half a length to the good, and had settled into perhaps their best rhythm of the race. Though not as long as Cambridge, they had a powerful and punchy stroke, and their boat was travelling well on the recovery. 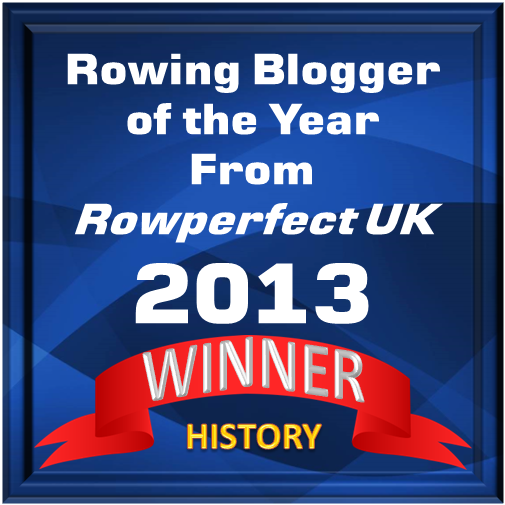 The masterstroke in the race undoubtedly belonged to the Oxford cox, Frankie Satchwell. At the 9:10 mark, she let her boat run slightly wide around the bend, enticing the Cambridge cox to steer in to avoid being pushed out of the stream. This drew another warning to Cambridge, and as Mason steered away, Satchwell called a push to gain a speed advantage. Eight strokes later, with Cambridge’s bow still pointing away, Satchwell tightened her line on the corner, turning a half length advantage into almost a length as Cambridge changed course once more to stroke side. Oxford’s rhythm and power made the difference after Hammersmith Bridge. Photo by permission of Allmarkone. From here, the momentum was all Oxford’s, and despite a gallant effort by Cambridge to hold on, the Dark Blues soon galloped away to steal clear water, and then a two length lead. Just after Barnes Bridge, the Cambridge men made a last, desperate bid to make contact, but Oxford held them off, and crossed the line two and a half lengths in front in a race time of 17:43.58. Cambridge had won the last three races, and for Mahesh and some of his squad, the desire to avenge themselves was tremendous. ‘It’s an absolutely incredible feeling to win, especially as we had five returners in the boat who had all tasted defeat in the past. There was a real hunger this season, and the move to the Tideway was a real galvanising force,’ Mahesh said. While FISA has cast the future of the Lightweight Eight into question, the Lightweight Boat Race has shown how good lightweight rowing can be. Without the possibility of massive differences in power or weight, technique and endurance are brought to bear in a relentless match race duel. Lightweight rowing has found a new showcase on the Tideway. Long may it flourish!